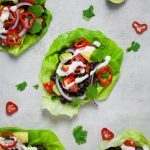 We’ve been making these awesome lettuce leaf tacos for years. It’s one of our favourite quick and easy meals. They take no time at all and they never get boring. This is a new and improved version of something we shared a while back. We’ve refined the recipe, packing in more flavour and making it even easier than before. If you’re making the cashew sour cream, soak the cashews in hot water and leave to one side. Drain and rinse the beans, then peel and dice the garlic. Add the beans, garlic, cumin, paprika, chilli powder, salt and pepper to a frying pan over a medium-high heat, then stir everything together and cook for 3 minutes. Add 190ml (3/4 cup) of water to the pan, lower the heat and gently simmer for 10-12 minutes or until most of the liquid has evaporated. Meanwhile, peel and thinly slice the onion. Then scoop the flesh out of the avocado and slice it into small pieces, discarding the stone. Slice the fresh chillies into rings and quarter the cherry tomatoes. If you’re making the cashew sour cream, drain the cashews then add them to a blender along with the remaining ingredients and blend until smooth. Prepare the lettuce by washing the leaves to remove any dirt and trim the ends. 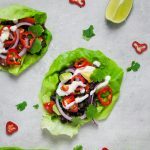 Lay the lettuce leaves flat and start layering the ingredients. 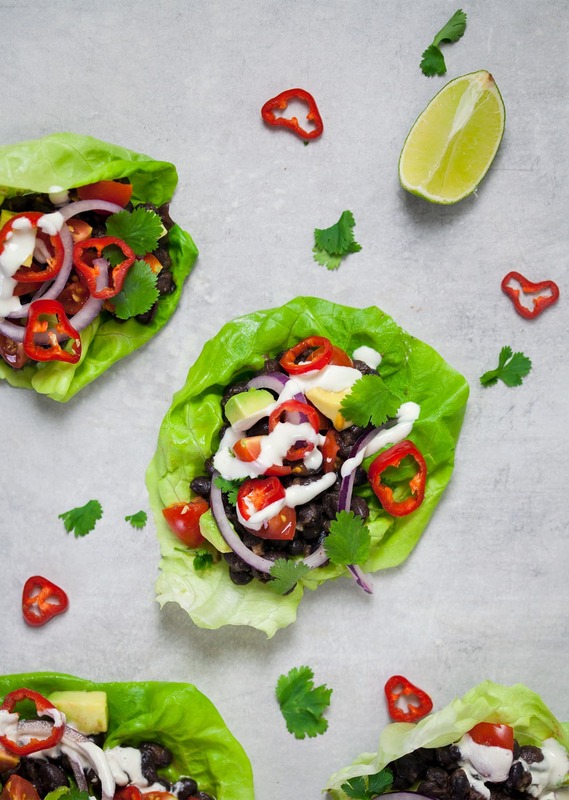 Start with a couple spoonfuls of the black bean chilli mixture, followed by a small handful of the cherry tomatoes, red onion, avocado, fresh chilli and coriander. To serve, squeeze fresh lime juice over the top and drizzle with cashew sour cream. Why soak the raw cashews in boiling water? Why not just drop them in the blender raw? Hey Scott. Soaking the cashews will make it easier to blend the ingredients into a cream. If you don’t want to put the cashews into boiling water, you can soak for longer (8 hours or overnight) in the fridge. Soaking makes it easier to blend them into a creamy sauce. Your body will digest soaked nuts better …your stomach and colon will thank you for that! I’ve made these before & loved them. They’re filling with the black beans but I didn’t make the cashew sauce. I also wanted to note 1st ingredient called for drained & rinsed black beans. I put the avocado, lemon juice and garlic in a small food processor and used that, instead of the vegan sour cream. It turned out awesome. I also didn’t cook the beans, I just added the spices to them, along with the veggies and fruit, stirred and refrigerated it. I put the cilantro and jalapeño in the guacamole and used that instead of the vegan sour cream. It turned out awesome. I also didn’t cook the beans, I just added the spices to them, along with the onion and tomato stirred and refrigerated it. Then topped the lettuce with that and put the guacamole on top. Fantastic recipes! You’re doing a great job, keep it up! Love and support!